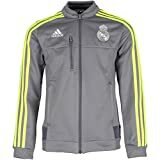 Official 2015-2016 Real Madrid Anthem Jacket, available to buy online in junior sizes small boys, medium boys, large boys, XL boys, XXL boys. This anthem jacketÂ forms part of the Real Madrid 2015-2016 training range and is manufactured by Adidas. This anthem jacket is grey in colour.